Honors Geometry is a class designed for students that excel in mathematics! This includes 8th graders, freshmen and sophomore students. The main differences between Geometry and Honors Geometry are pacing, teaching style, and extended work in all topics. In this unit, we learn all of the crucial vocabulary needed to master Geometry. Instead of students just "copying" definitions out of a book, you will write your own definitions! Topics include lines, angles, polygons, triangles, quadrilaterals, and circles. As you go, practice your mastery of these definitions by clicking on these vocabulary review games that I designed especially for you! In this unit, you learn how to use a different kind of reasoning than in other math courses. The two main kinds of reasoning you use in life are inductive and deductive reasoning. 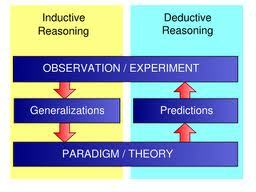 Did you know that you have used inductive reasoning since you were a baby? It is the process of observing data, recognizing patterns, and making generalizations about those patterns. You learned correct ways of speaking by listening to the patterns of correct speech. Deductive reasoning is the process of showing that certain statements follow logically from agreed-upon assumptions and proven facts. Lawyers use deductive reasoning to show how evidence proves their case based on the jury believing the evidence and accepting that is true. You will formulate models to represent problems and use both inductive and deductive reasoning. Studying angles and their properties will help you understand what reasoning we use, and we will be playing the deductive reasoning game..
How to use your abilities to decide on a career!! If you can recognize patterns (inductive reasoning), then your specific ability can help you decide on possible careers! 1. If you are good at -- Concept organization, or the ability to break down complicated ideas and make them more easily understood. Jobs that require this skill: Engineers, computer programmers, editors. 2. If you are good at -- Inductive reasoning, which means you can quickly see a common element among seemingly unrelated ideas. Jobs that require this skill: Research scientists, police detectives, lawyers. 3. If you are good at -- Structural visualization, or how well you can picture three-dimensional objects in your mind. Jobs that require this skill: Engineers, architects, physicians. 4. If you are good at -- Numerical reasoning, or the ability to decipher numerical patterns and concepts. Jobs that require this skill: Economists, financial analysts, accountants. 5. If you are good at -- Foresight, or the ability to imagine lots of possibilities—and anticipate potential problems. Jobs that require this skill: Politicians, entrepreneurs, physicians, activists. SLOPE: In class, we talked about a slope of 100% and whether we could drive, walk, skateboard, etc up or down it. Currently, the greatest slope of a road worldwide is in New Zealand, and it has a 78% slope. Check out these pic's and then think about whether you could make it up a 100% slope?!? Construction #7: Parallel to a line though a point.